I need to convert a video file from Matroska container into mp4 container. Matroska file contains one h.264 video track and one AC3 sound track. It should be possible to do this losslessly, but how to do it with native Ubuntu tools? Transcoding is not an option. Perhaps the easiest tool for that is ffmpeg, or avconv from the libav-tools package. Libav is a fork of FFmpeg, which Ubuntu switched to for a few years until Ubuntu 15.04. It is one of the backends for many of the GUI tools mentioned in other answers. I had to add -fps 24 option because MP4Box didn't detect video fps correctly. Depending on usage AC3 audio track should be re-encoded into something else before muxing. Now you have remuxed streams from matroska container into mp4 container without losing any quality. EDIT: MP4 doesn't officially support AC3 audio so the audio track should be converted into a supported format (eg. AAC, MP3) if you want the file to be playable with something else than VLC. It has good GUI interface. When converting from mkv to mp4 it is not re-encoded. The convertion is done within a minute (for a 60-min video). 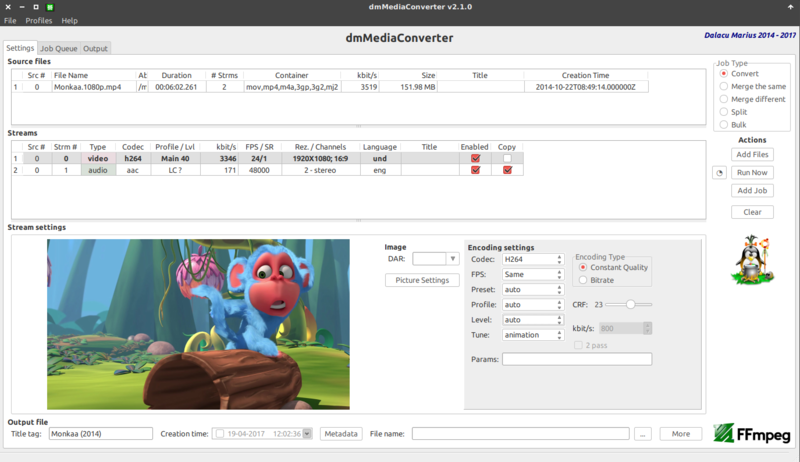 Open the mkv file in avidemux. Select safe mode if prompted. Leave the video as copy. Choose File-> Properties. Check if the audio codec is aac. If audio codec is NOT aac, select aac(faac). Select save, choose location and type a filename with .mp4 as the extension. Note: Sometimes (~10% chance) it may fail. Then use handbrake(re-encode). Since MPEG Part 14 supports h.264 and AC3 natively without transcoding, you can simply rename the file so it has an .mp4 extension instead of a .mkv extension. Not the answer you're looking for? Browse other questions tagged ffmpeg video-conversion mp4 mkv avidemux or ask your own question. Joining Two MKV files in Ubuntu? What's the most space-efficient multimedia container available in Ubuntu? How can I convert an ogv file to mp4? How to convert an mpeg2 to a streamable or fragmented mp4? How do I reduce the screen and file size of a recorded video, plus convert to FLV? How to convert AC3 to Flac and apply a delay?